There are so many beautiful Cape Cod towns. Before visiting them, take a look at the above Cape Cod map. The island is divided up into separate sections or areas, each offering very different experiences. The Upper Cape is actually the area that you encounter first and is in fact the most southern part of the Cape. Confused? So was I. Bourne, Sandwich, Sagamore, Falmouth, Mashpee, Cotuit, Osterville, Centerville and Marstons Mills are considered to be part of the Upper Cape. While part of the town of Barnstable is located on the Upper Cape, it is more commonly considered to be in the Mid-Cape area. Falmouth is the home of the famous Woods Hole Oceanographic Institution and several other research organizations. It is also one of the main places to catch a ferry over to Nantucket or Martha's Vinyard. Next is The Mid-Cape which includes the towns of Barnstable, Yarmouth and Dennis. The Mid-Cape area features many beautiful beaches, including warm-water beaches along Nantucket Sound, e.g. Kalmus Beach in Hyannis. Hyannis and Hyannisport are the economic engines of Cape Cod with a large shopping complex Cape Cod Mall and many chain stores. It is also one of the few areas you will find "fast food" joints. 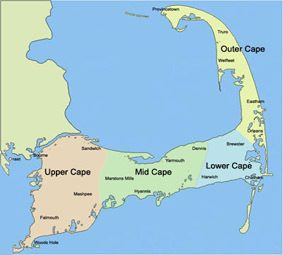 The Lower Cape is the narrower portion of the cape, where it bends sharply to the north. This section includes the towns of Harwich, Brewster, Chatham, and Orleans. It is my second favourite part of Cape Cod. Orleans is where you go for groceries at the Stop 'n' Shop and has drug stores, liquor stores (called a package store on the Cape) and many great specialty shops. Visit the shopping page to find out more. Brewster is a great place for camping and has many nature hiking trails. It is home to the famous "General Store" which defines this idyllic Cape Cod town. Chatham is more ritzy and it home to the famous Chatham Bars Inn. It is also the gateway to Monomoy Island where you can spend the day exploring with nobody in sight except numerous seals and birds. My favourite part of Cape Cod hands down, is the outermost part, the Outer Cape. Here you will find the towns of Eastham, Wellfleet, Truro, and Provincetown. This area includes the Cape Cod National Seashore. This national park comprising much of the outer Cape including the entire east-facing coast, is home to some of the most popular beaches in the whole United States. Here you will find some of the most visited (crowds in summer) such as Coast Guard Beach and Nauset Light Beach in Eastham. This part of the Cape is truly wild and untamed -- despite the tourists' many footprints in the sand. Coming to this part of Cape Cod in late fall or winter will sometimes both scare and amaze you. Nor'easters roar up the coast with such force that you can't even stand on the beach because the sand being blasted against your skin feels like needles hurdling into you. In the summer though, the miles of sandy beaches and the fresh salty air, really have a calming way about them. See the beaches page for all the info you can possibly need. We usually stay in Eastham due to it's close proximity to supplies in Orleans and The National Seashore's beaches. All along highway 6 there are many great places to stay. You can choose hotels, motels, cottages and even camping. We have tried them all and will let you in on our findings on the Cape Cod Accommodations page. Truro was once an artists retreat and that history is evident still today. You will find scores of art galleries, as well as many "artsy" type shops. We bought a fantastic (although heavy) solid teak coffee table at one of these shops. We had a mid-size car at the time and it took up most of the room coming back to Ottawa. This is perhaps one of the prettiest Cape Cod towns to visit. 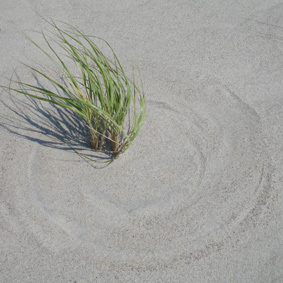 The beaches here are still part of the National Seashore and are even wilder than in Eastham. They are a bit less traveled so worth the visit. Provincetown (people in the know refer to it as P-Town) is the "Key West" of New England. This Cape Cod town is loud and proud. P-Town is a gay mecca of sorts and a great spot for people watching. Be tolerant and open minded. 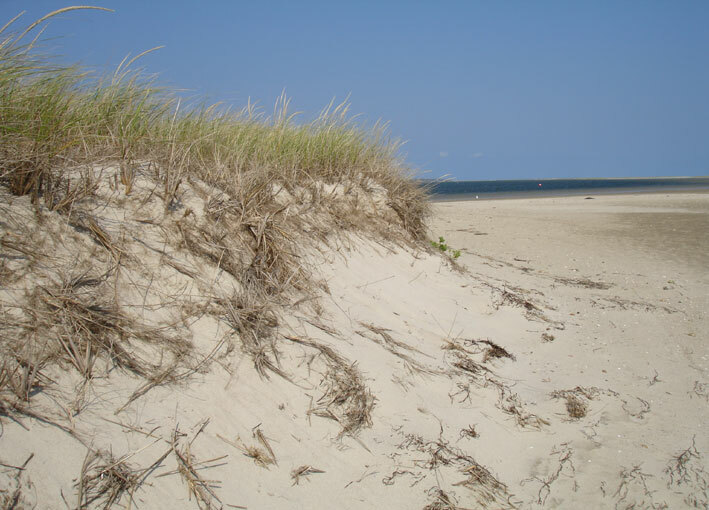 Nearly two-thirds of the town's land area is covered by the Cape Cod National Seashore. To the north lie the Province Lands, the area of dunes and small ponds extending from Mount Ararat in the east to Race Point in the west, along the Massachusetts Bay shore. These dunes are a tough trek on a hot summer day but offer wonderful photographic opportunities. So you see, all Cape Cod towns are varied and each offer their own charm. I promise you will find something memorable in each one of these picturesque places.